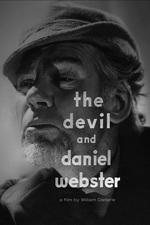 A nineteenth-century New Hampshire farmer who makes a compact with Satan for economic success enlists Daniel Webster to extract him from his contract. A retelling of the Faust legend, the film is based on the Stephen Vincent Benét short story of the same name. Available to stream commercial-free on Hulu Plus, and for rent from Amazon and iTunes. Part of the Criterion On Hulu film club. 2. I feel like maybe I have missed some American mythologies around both Daniel Webster and New Hampshire. I know Daniel Webster was supposed to be arrogant and that he was popular, but did he really command such a cult of personality? And did people put that much importance on being a New Hampshire man? I was kind of amused by those things, but I don't think I was supposed to be. It was probably just me being ignorant of that aspect of American history. 3. I really, really liked the dancing scenes where the devil's influence would take over, and the camera would be flailing around and the music would get all sped up and discordant, like how Pop Goes the Weasel slowly morphed into this nightmarish hallucination. Jimmy Stewart is given Webster's desk in Mr. Smith Goes to Washington. ernielundquist mentioned F.W. Murnau's Sunrise; here's a neat little coincidence: the director of this adaptation of the Faustian tale appeared in Murnau's own take on the story, 1926's Faust. Fans of this movie (or just movies in general) should definitely check it out. It's one of the most visually stunning films I've ever seen, it's incredibly entertaining, and unlike almost any other film it portrays a Mephisto who is utterly charming without taking away from him being Bad News you should avoid at all costs. That was a lot of fun. I saw Murnau's Faust not that long ago so this was an interesting contrast to that. You can't help but feel the tension between the very American feel to the story itself and the more European sensibilities of the director. It's interesting how they keep inserting bits of 1930s liberalism into a story set a hundred years before. The bankers are the bad guys and the devil is said to be responsible for slavery and native american genocide. Interesting too that the mansion that he builds with the devil's money looks so much like a stereotypical southern plantation in contrast with the simple new england farm. Wonder if that was a dig at Gone with the Wind which came out a couple of years earlier? The camera work and the editing seemed a lot more modern than a movie that old. I wasn't surprised when I saw that Robert Wise was the editor. Thanks for the suggestion, I probably wouldn't have watched this one otherwise. So this is another well put together movie that that I didn't really like. Every shot is nigh on perfect, the score is pretty good, so I think this week it comes down to not liking the script. I had to fast forward through a great deal of the middle of the movie, especially the scenes with Belle. For whatever reason, that character just rubbed me the wrong way. Daniel Webster's closing arguments at the end are worth seeing though. As with Daisies though, I'm very glad I watched it. The contrast between this movie and Tokyo Story in terms of composition and photography alone made it worthwhile for me. I love this movie. What I love most about it is Huston's absolute joy in playing the Devil. Admittedly, the film can drag when he's not onscreen, but watching Huston allows me to forgive all. As Ian A.T. said, too, Dieterle is at his visual best here. Huston doesn't get too much attention these days outside of some classic film blogs, but he was probably one of the greatest screen actors of the studio era. Check out Dodsworth sometime.